President Xi Jinping announced at a gathering celebrating the 30th anniversary of the founding of Hainan province and the Hainan Special Economic Zone in Haikou, Hainan, on April 13 that the island province will be turned into a free trade port. We have since learned that Hainan will take on a larger role through a pilot scheme in the nation's ongoing reforms and opening-up, according to the nation's development strategy for the next 40 years. This will be another four decades of great success for the Chinese mainland following the first 40 years of reform and opening-up. According to the top-level design by central authorities, the Hainan Pilot Free Trade Zone should have made significant progress by 2020; its free trade port system should take shape by 2025 and become much more mature by 2035. Its business environment is among the best in the world; by the middle of this century, the province will achieve socialist modernization ahead of the rest of the country. It will be able to boast a highly market-oriented, internationalized, rule of law-based and modernized system of administration to keep it ahead of other places in terms of competitiveness and cultural influence. This plan is an integral part of the greater blueprint for building a strong, modern socialist country as outlined at the 19th National Congress of the Communist Party of China. This will once again show the world China is pursuing the great rejuvenation of the Chinese nation through wider reforms and opening-up on all fronts. After the 18th National Congress of the CPC in November 2012, as a ground-breaking effort to deepen reforms and opening-up on all fronts, Shanghai became the first mainland city to establish a pilot free trade zone (PFTZ) in September 2013, combining three separate bonded areas with a total land area of less than 29 square kilometers. In December 2014, the PFTZ expanded to include the Lujiazui financial district, Jinqiao development district and Zhangjiang high-tech district; three more PFTZs were established in Guangdong, Fujian and Tianjin. All four PFTZs occupy an area of around 120 square kilometers each, larger than Hong Kong Island but far smaller than the Hong Kong Special Administrative Region. In March last year, seven more PFTZs were established in Liaoning, Zhejiang, Hubei, Chongqing, Sichuan and Shaanxi. Building on the momentum of PFTZ expansion, the 19th National Congress of the CPC decided to "try and develop free trade ports (FTPs)". Many people predicted then that the first FTP will probably be an existing PFTZ (such as the one in Shanghai) but Hainan province, which covers about 339,000 square kilometers and has a population of about 8.67 million, was chosen as the country's first FTP. Hong Kong has been a world-famous free trade port for a long time but that does not mean it cannot be inspired by the decision to turn Hainan Island into an FTP with Chinese characteristics. Hong Kong has been a free port since 1842 but its economy depended mainly on transshipment trade until the 1950s, when export-oriented manufacturing began growing. This became a bona fide pillar industry in the 1970s. In contrast the Hainan FTP will not rely on foreign trade and manufacturing as growth engines. Instead it will focus on developing tourism, modern services and new technology industries. This means it is starting on a higher level than Hong Kong did, and is aiming for a higher position. 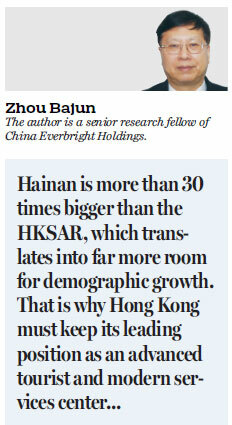 Hainan is more than 30 times bigger than the HKSAR, which translates into far more room for demographic growth. That is why Hong Kong must keep its leading position as an advanced tourist and modern services center while working harder on developing its innovation and technology sector. This is needed to maintain its economic lead over Hainan. Take the modern services industry as an example. Hainan plans to focus on developing tourism, internet-based services, medical and health services, financial services and conference and exhibition services. It will also host international exchanges of energy resources, shipping, bulk commodities, property rights, stocks and carbon emission rights. Hainan will increase international flights to major destinations around the world and improve the efficiency of its shipping ports, especially Haikou and Yangpu. All those efforts will put pressure on Hong Kong to elevate its own financial markets, air-shipping services and port and transport services to even higher levels. From the beginning of next month Hainan will let travelers from 59 countries enter visa-free. The southernmost province of the country will also introduce policies designed to attract more tourists. These include more duty-free shopping options for foreign visitors, a higher ceiling on duty-free spending per visit, and adding rural destinations and tropical small towns with unique ethnic flavors. Hong Kong, on the other hand, has been losing its "shoppers' paradise" appeal in recent years. It must find effective ways to restore this, while developing new tourist attractions with Hong Kong characteristics. Hainan is a maritime province; this is why it will significantly increase investment in the exploration and development of ocean resources and step up development of new ocean-based industries. Hong Kong, a maritime city, should therefore do whatever is necessary to enhance its own ocean-based industries in the future. Most importantly, Hong Kong needs to become more innovative soon - not least in resolving the biggest hindrances to economic, political and social development.